Bison river resort is a unit of Indian adventures which owns resorts in Madhya Pradesh & Rajasthan. 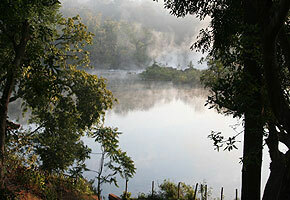 Dandeli wildlife sanctuary is rich in flora and fauna. You are sure to spot a whole lot of bird species and mammals. Spots around the resort: Vantage Point to view Supa Dam, Crocodile viewing on River Kali, Syntheri Rocks, Kavala Caves, Coconut and Banana plantations, Skyes Point, Vincholi Rapids, Little Tibet Kali river is known for white water rafting. You can hire the services of professionals rafters and do rafting for around 3 hours. There are various packages available. Tariff is per person per night on twin sharing basis & includes accommodation, all meals one session of park safari. Check in 12 noon / Check out 11 am. For those opting for 2 nights/ 3 nights package would get 1 Park Safari,1 Coracle Ride/Boating, Barbecue Dinner, Wildlife Film Show, Visit to Vantage Point to view Dam Site, Fishing, Access to Wildlife Library, Indoor & Outdoor Games, Nature Walk & BirdWatching apart from accommodation & food. Taxes extra at 6% on the above rates. Children below the age of 5 will be charged Rs. 1000 & 1300 plus 6% respectively for 2/3 nights package. Children between 5 to 12 years will be charged Rs. 2400 & 3425 plus taxes per package. White water rafting charges extra. 25% additional supplement will be charged for the following period. 6th November to 18th November 07 ( Both days inclusive) for Diwali. 23rd Dec to 3rd Jan 2008 ( Both days inclusive) Christmas and New Years. The above rates are not valid from foreign nationals. Tariff is subject to change without notice. Cancellation or refund will be subject to respectiv hotel guidelines. 22 kms from Dandeli town is this place called Ganeshgudi. The resort is 32 Km from Londa ( closest Railhead) , 140 km from Dabolim,Goa (Airport) & 90 km from Belgaum (Airport) If you are going by bus, get down at Dandeli town and take a jeep or taxi ( 45 mts drive). The resort can organise pickup / drop at cost.